​The Teumessian Fox was a legendary beast from Greek mythology, with a mythical attribute that said it was destined never to be captured. ​The first mention of the Teumessian Fox is during the time when Creon was regent of the city of Thebes for the first time, following the disappearance of King Laius. One day, near to the village of Teumessus upon the plain of Thebes, appeared a gigantic monstrous fox, a fox which was given the name of Teumessian Fox because of its location, although the beast was also named the Cadmean Vixen or Fox, for Cadmea was an alternative named for Thebes. ​The appearance of the Teumessian Fox is attributed to the displeasure of one, or more, of the Greek gods, for the people of Thebes, and its rulers, had a habit of antagonising these deities. In founding Thebes, Cadmus had killed a serpent of Ares, Pentheus and the people of Thebes had rejected the divinity of Dionysus, and Niobe had proclaimed herself superior to Leto. It is most commonly said that it was the displeasure of Dionysus that saw the Greek god of the Vine bring forth the Teumessian Fox to Thebes. ​It is assumed that the Teumessian Fox was one of the monstrous offspring of Typhon and Echidna, but nowhere in antiquity was this specifically stated, and so perhaps it was just a creation of the gods instead. Gigantic in size, it was the horrific actions of the Teumessian Fox that made it monstrous, for this giant fox was a man-eater, preying upon the unwary. Hunters were dispatched to kill or capture the Teumessian Fox, but no weapon could hit, and no snare could entrap it; for it was destined that the Teumessian Fox would never be caught. In the end, to placate the Teumessian Fox, Creon decreed that every 30 days a child would be left for the fox to feed upon. ​It was at this time that Amphitryon came to Thebes, he and Alcmene having been exiled from Mycenae. Amphitryon required an army so that he could go to war with Taphos, to avenge the deaths of Alcmene’s father and brother. Creon promised Amphitryon the Theban army for his expedition if he would rid Thebes of the Teumessian Fox. Amphitryon tried hunting the Teumessian Fox in the traditional manner, but he had no more joy than the hunters that had gone before him, but then Amphitryon was reminded of the existence of Laelaps, the hunting dog destined to always catch its prey. Amphitryon thus departed from Thebes to seek out Cephalus, who was now the owner of Laelaps. Laelaps had been given to Cephalus by his wife Procris, who had herself received it from King Minos, who had been left it by his mother Europa, who had received it from Zeus. Promising a share of the spoils for a victorious war with the Taphians and Teleboans, Amphitryon convinced Cephalus to bring Laelaps to Thebes. When in Thebes, Laelaps was released from its leash, and the hunting dog set after the Teumessian Fox, who commenced to run away. So the fox that was destined to never be caught was being chased by the dog that was destined to catch everything that it hunted. Zeus, from Mount Olympus, observed Laelaps chase of the Teumessian Fox, and realising the paradoxical nature of this hunt, decided to intervene. Zeus therefore turned the Teumessian Fox into stone, and did likewise to Laelaps as well. 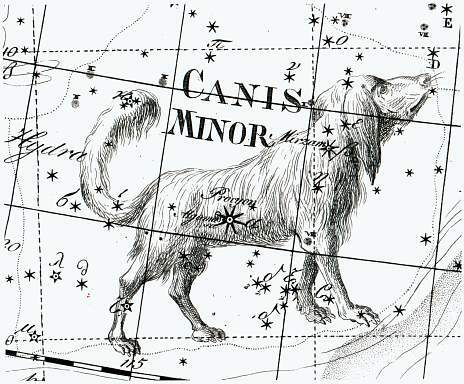 Then Zeus, transferred the likeness of the two mythological animals into the night sky, where the Teumessian Fox became Canis Minor, and Laelaps became Canis Major, and the unending chase across the night sky continues to this very day. Thus, Amphitryon had done as Creon had decreed, and Thebes was free of the threat of the Teumessian Fox, and Amphitryon was given the troops required for his expedition. ​The removal of the Teumessian Fox provided only a brief period of relief for the people of Thebes, for in but a short time another monster, in the form of the Sphinx, came to Thebes, and once again the Thebans were in deadly peril.